There is a strong dose of Pop Art humor mixed with whimsical childhood memories in Suzanne Syz’s jewelry designs: multi-colored enameled earrings in the shape of small Life Savers candies, a Smarties bracelet so realistic you’ll want to eat each enamel piece, a pair of Hit the Bullseye earrings rendered in diamonds and black enamel with tiny darts in their center. 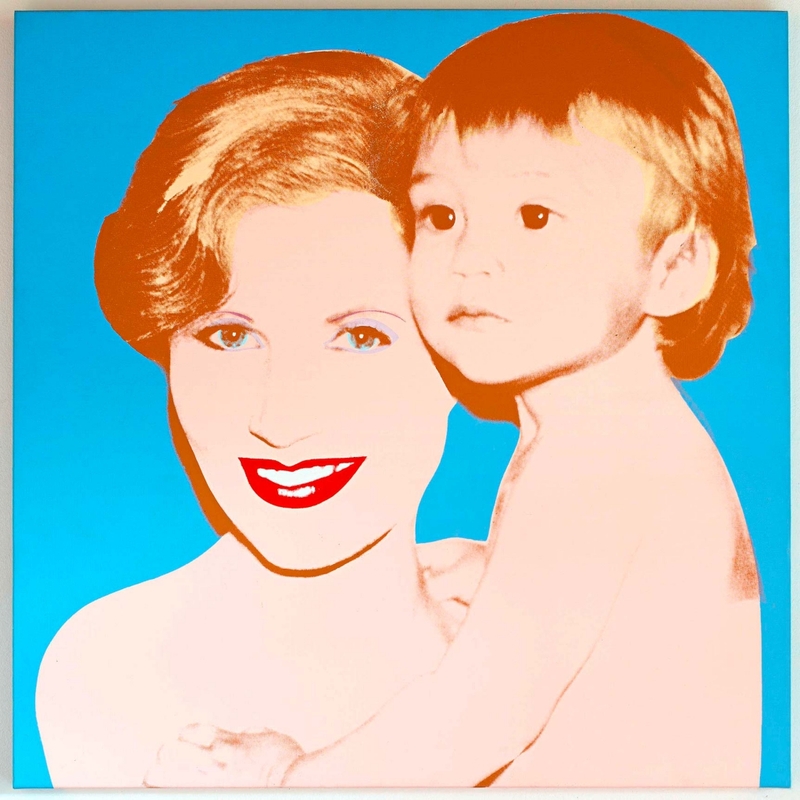 Warhol came back with the portraits of her and her son in three different colors and told her she could have all of them thanks to her smile! The statuesque redhead says laughing has always been a big part of who she is, “so much so that Jean Michel [Basquiat] one time drew my teeth on a napkin. We’d been telling each other dirty jokes, and we were laughing like crazy and that’s when he drew them.” Born in Zurich, Syz briefly dabbled with modelling in Paris, before moving to New York in the early 1980s with her soon-to-be husband. Swiss Gallery owner Bruno Bischofberger started introducing the couple to some of the New York artists he was championing back in Europe: “I lived downtown, we’d just married, and Bruno [Bischofberger] was a great friends of ours, and still is, and he introduced us to the group of artists he was working with.” As the pair met artists they liked, they also started commissioning works from them – Julian Schnabel did a portrait of her, while Francesco Clemente did one of her husband Eric, and McDermott McGough did a portrait of the family. After a spell working as an interior designer, Syz turned to jewelry design in the mid-1990s almost by necessity. “I couldn’t find high-end jewelry pieces that I liked and matched my personality. I felt everything was making me look older. 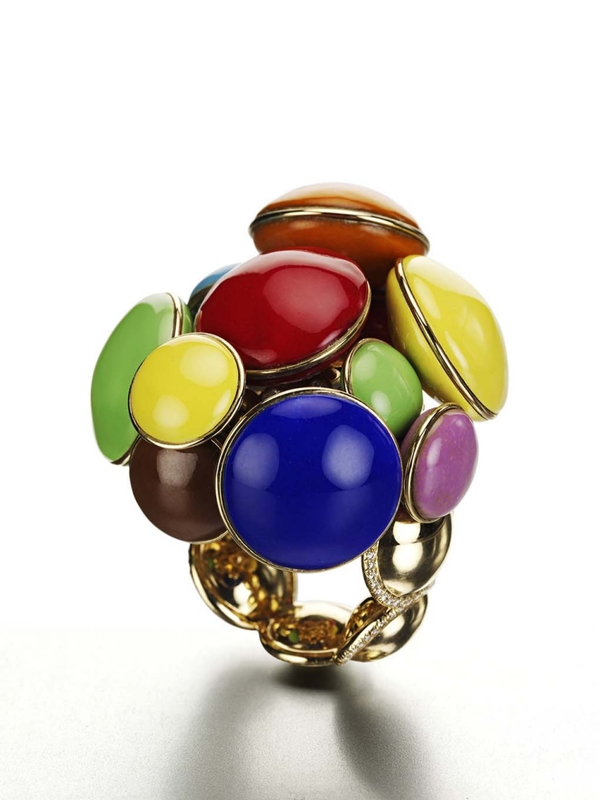 I wanted something playful and a bit funky, something that would take the seriousness out of jewelry but still use the best stones and materials,” she explains. She started making pieces for herself, like a pair of Sun and Moon earrings, but when Elizabeth Taylor, with whom she was having lunch one day, literally bought a turquoise necklace off her neck, she felt it was time to make it a business. Right from the start Syz decided to focus on one-of-a-kind pieces while reaching out to craftsmen in Switzerland for their sense of precision and perfection, certain the “Made in Switzerland” label would be important to her firmly held desire to champion “honest luxury.” Arguing that clients deserve to get truly unique pieces when they are paying top dollar for it, she explains, “It’s my obsession to offer unique pieces, because I think in the niche that I am, everybody knows each other somehow, and who wants to go to a party and see the same jewelry on someone else? Every piece is expensive to make and expensive to buy and I don’t believe in buying something expensive if it’s not unique.” For Syz, luxury is not only about big stones, but about using innovative materials to create unusual designs. For her most recent creations, many pieces employ titanium in different colors. “I have been working with titanium for about seven or eight years. I love the metal because it’s as light as a feather but very strong, so it gives me the opportunity to work the metal very differently than gold,” she explains, adding that that lightness allows her to play with large stones and scale without making the jewelry too heavy.